I’d say muffins are my thing, because this vegan pumpkin muffins recipe is the 23rd muffin recipe on my blog! So, you might also call it a muffin blog 🙂 Just kidding! Watch tutorial video further down! I’m so into muffins, because they make an excellent go-to snack that are easily made in big batches and then frozen to be conveniently grabbed whenever needed. Last year, when I started vegan Candida diet, I created the first pumpkin muffins recipe suitable for Candida menu plan. Needless to say, they turned out super yummy! However, this time I wanted my pumpkin muffins to have chocolaty flavour. Therefore, I added carob and cocoa for comforting and hearty chocolate taste without compromising with wholesomeness. I still remember the times when I thought of muffins as something you could only eat very rarely and feeling guilty afterwards. Instead, when using wholesome ingredients, muffins can actually be healthy food to be enjoyed every day. Thus, my vegan pumpkin muffins recipe uses whole grains instead of refined ones and pumpkin puree instead of oil or butter. Furthermore, the recipe doesn’t include refined sugar, but birch xylitol, which can also be substituted with other natural sweeteners. I only use xylitol or stevia not to risk with getting Candida overgrowth again. 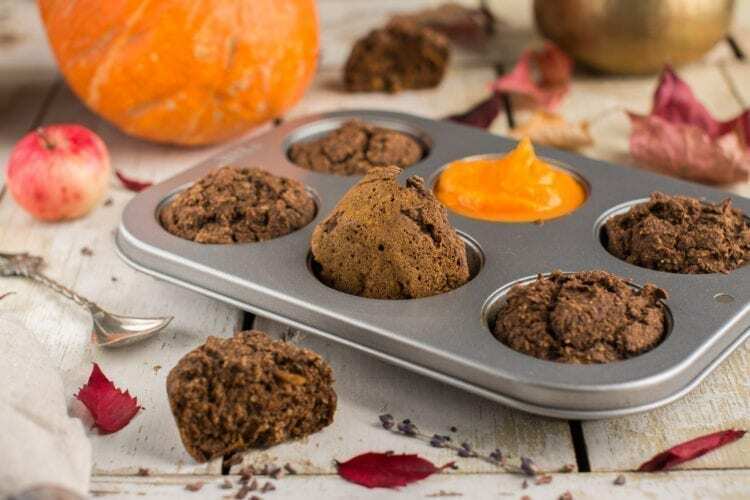 To sum it up, my chocolaty pumpkin muffins recipe is vegan, plant-based, gluten-free, oil-free, low-fat, refined sugar free and Candida diet friendly (not for those on the cleanse though). In a bowl whisk together all dry ingredients. Next, add pumpkin puree and plant milk. Mix until well incorporated. Then, stir in grated zucchini. Finally, divide batter between 6-8 muffin moulds and garnish with dark chocolate chips or chopped dark chocolate (optional). Bake at 175°C for 33-35 minutes (6 muffins) or 30-33 minutes (8 muffins). Nutritional info (⅛ of the recipe): 99 kcal, 13.3g carbohydrates (81.7% of calories), 2.08g fats (18.9% of calories), 4.21g protein (17% of calories), 5.09g fibre and 8.2 GL (glycemic load) points. Nutritional info (⅙ of the recipe): 132 kcal, 17.8g carbohydrates (81.7% of calories), 2.77g fats (18.9% of calories), 5.62g protein (17% of calories), 6.79g fibre and 10.9 GL (glycemic load) points. First, cut pumpkin into smaller cubes and pour them into a pot or saucepan. Next, add a bit of water and simmer covered until the pumpkin is cooked (10-15 minutes). Add water if necessary. Finally, puree with immerse blender. In the end, should there be any leftovers, transfer it into jars and store in refrigerator. First, you can use more (or less) xylitol, depending on how sweet your pumpkin is and which plant milk you have. Alternatively, use any sweetener you like (if not on Candida diet) – date paste, coconut nectar/sugar, maple or agave syrup etc. Next, use any winter squash you like or have in hand. I prefer butternut squash for its sweetness and thick texture. Finally, remember that you’d most probably need to add more of the sweetener, if you use naturally NOT sweet plant milks (almond, hazelnut, soy, quinoa, millet, hemp). Hi Nele, love your recipes and your site. You have the best muffin recipes. I did make these muffins and they are great but I just want a pumpkin muffins recipe without chocolate and could not find one on your site even though you mention one. Could I just leave the carob and cocoa powders out and proceed or would I need to match it possibly and add more buckwheat flour or other to make up for that subtraction of a dry ingredient do you think? Same with the beet-carrot chocolate muffins. They look wonderful but I just do not want chocolate in them. Could I just leave the carob and cacao powders out of it also or do I need to add more oat bran or buckwheat grouts to take its place to soak up the liquids since I will be minus that dry ingredient? I am doubling both recipes so I have 12 muffins at least so that would mean 6 Tbsps of dry ingredients I am taking out of both recipes is why I ask. 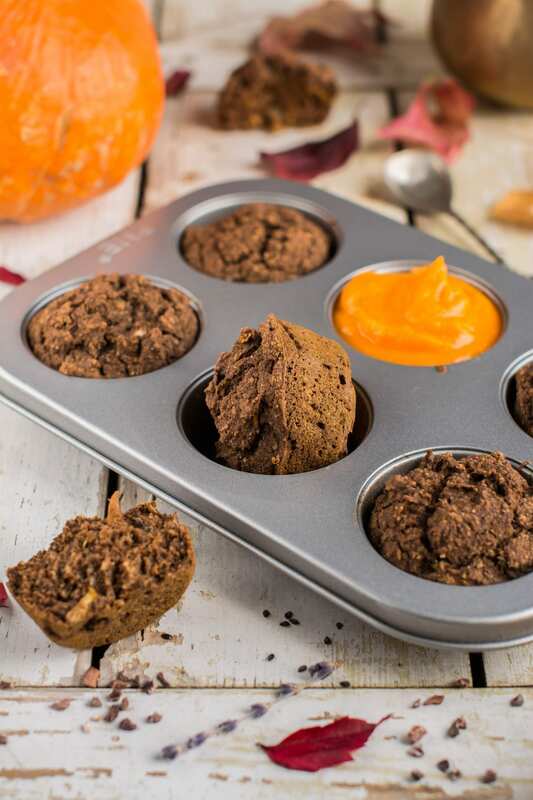 I see you already found my other pumpkin muffin recipe without carob or cocoa! Yes, you could leave the carob and cocoa out and add 2 tbsps. (4 tbsps. in case of a double batch) more buckwheat flour. I wouldn’t add the same amount as flour absorbs much more liquid than the powders. Ask away, if you have any further questions! Hi thanks for your response. Actually I have not found your pumpkin muffin recipe without carob or cocoa. I did a search on your site and never found it if there is one as you mentioned in this recipe. I just meant I saw you mention there is one but I could not find it so I was asking if I could just leave out the carob and cocoa from the chocolate pumpkin recipe and leave them out of the chocolate beet muffin recipe or if I would have to change other things to do so also or whether you had a pumpkin and beet one without chocolate. 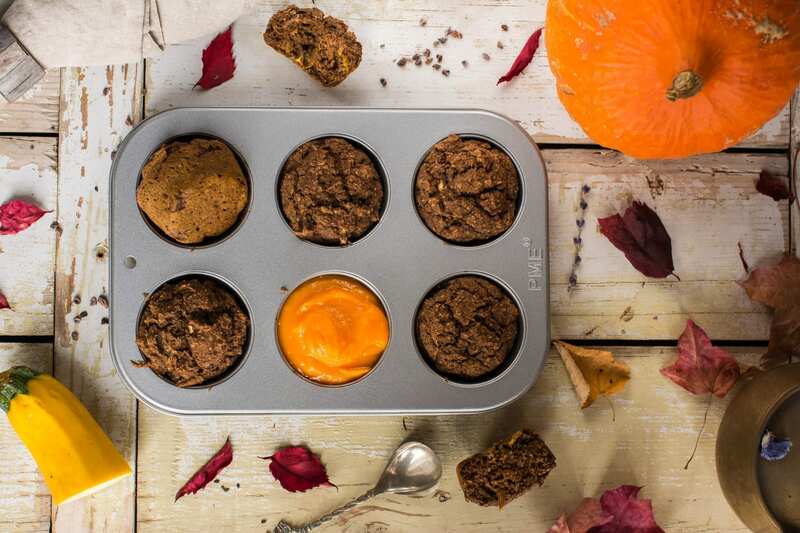 Do you have a link to your pumpkin muffins without chocolate? The only one I have is the butternut squash muffin recipe not the pumpkin muffin recipe without chocolate. I will look at your link for the non-chocolate beet recipe butreally wantto make pumpkin muffins also without chocolate if you have a link to it. Oops missed part of your post. I just wanted a non-chocolate pumpkin muffin and the beet-carrot sounds good but didn’t want any chocolate in it either for now. I wanted to let the pumpkin shine through (same with the chocolate beet recipe) so I figured that meant leaving the carob and cocoa/cacao out altogether for both. And you mentioned a nonchocolate pumpkin re pie that I couldn’t find as I mentioned. If there isn’t one I could try leaving both out which is 6Tbsps total and adding 4 Tbsps of buckwheat flour. 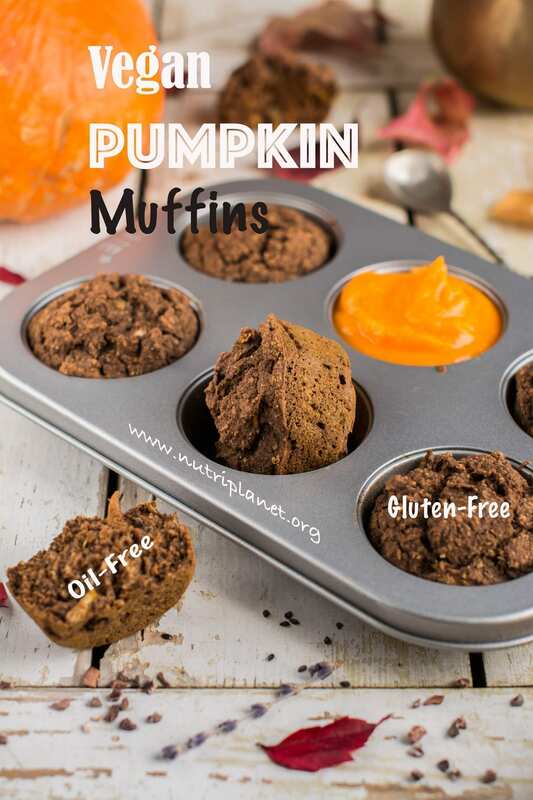 You commented under the pumpkin muffin recipe that does not contain chocolate 🙂 https://www.nutriplanet.org/2016/10/the-best-butternut-squash-muffins/ That’s why I thought you’d found it. Otherwise yes, you can leave them out and add more flour! Hi again, one last comment and than I will be set. If I use at least 6 medjool dates would that possibly be a replacement volume wise for the removal of the carob and cocoa or would you still advise adding 4 Tbsp of buckwheat flour for a doubled recipe? Thanks again for all your help. Dates don’t absorb liquids like flour or powders do. However, they add some substance, so I think I’d add a little bit less than 4 tbsps. of flour. You can always add more to the next batch if they turn out too moist. Well, they contain 1 cup of pumpkin puree 🙂 Also, you could sub zucchini with grated pumpkin. like the other recipe for the wonderful butternut squash muffins because I had it on hand and had no zucchini but I had not thought of grated pumpkin so I may have to try that and the extra buckwheat flour. I love the butternut squash muffins and have now made them 4 times now but my son wanted me to make something with pumpkin but believe it or not he doesn’t really like chocolate in general very much so I may even try the beet-carrot muffins without the carob and cocoa because I like the idea of having beets and carrots in there. Thanks again for the help. Ask away, if you have any questions about any other recipes! Hi again Nele. You create these recipes so I figured you may know how doubling etc works. I was already doubling thesewhen I spoke to you so I was adding 3-4 tsps of baking powder but I wasn’t sure if you always double all ingredients. I went ahead and shredded enough pumpkin for two batches of 12 so I want to make 24+ at one time (guess that is quadruple your recipe lol). So do I really probably take your 2 tsps of baking powder times 4 and put 8 tsps of baking powder?? That is why I was curious if everything is probably exactly quadrupled lol? I am not adding the chocolate as we discussed so that is not a worry. But I guess that means I need 4 cups of pumpkin purée also. Wow on the surface this seems like a massive amount of ingredients ha ha. But my main worry was the baking powder – or I think lol.